Mix all ingredients together well. 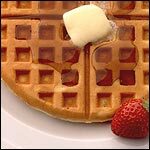 Pour into Belgian waffle maker for extra light waffles. It's the club soda that makes them extra light. Really works! Recipe requires Bisquick or similar baking mix. 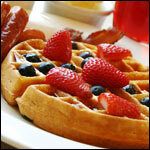 What do you think of Club Soda Belgian Waffles? Substitute for canola oil - you can use coconut oil in place of the canola (although I've never heard that canola oil is bad for humans). Coconut oil is really good for you, even my nutritionist has said so. Didn't work good for me. I could not get it out of the pan. 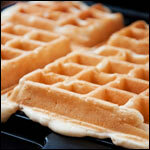 I would like to try this recipe as all the comments say this these waffles are outstanding! However, the recipe contains canola oil, which is apparently very bad for humans, is there an alternative oil I could possibly use? 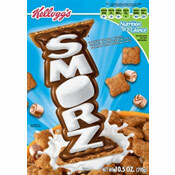 The best thing since sliced bread. I am using my waffle maker every weekend. 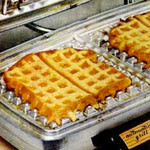 My favorite waffles ever!!! I like to add blueberries, frozen banana chunks, chocolate chips... the options are endless. This was very easy and the waffles are very good! My mom made these in the 1950's from a recipe out of a "Hints from Heloise" column in the newspaper. They're the best waffles ever. Use real butter and real maple syrup. Heavenly! Almost too good to be true. Almost. 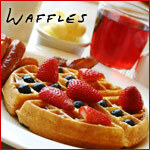 This is one of my favorite waffle recipes, easy and good.